On Saturday, December 27th, Apple’s first quarter of FY2015 drew to a close. While management has guided to revenue of between $63.5 billion and $66.5 billion in the period, the current Wall Street revenue consensus estimate of $66.46 billion is already pushing against the upper threshold of management’s revenue guidance range. Apple manages its business on a geographic basis. The graph below illustrates the regional revenue mix for the fiscal year ended in late September. 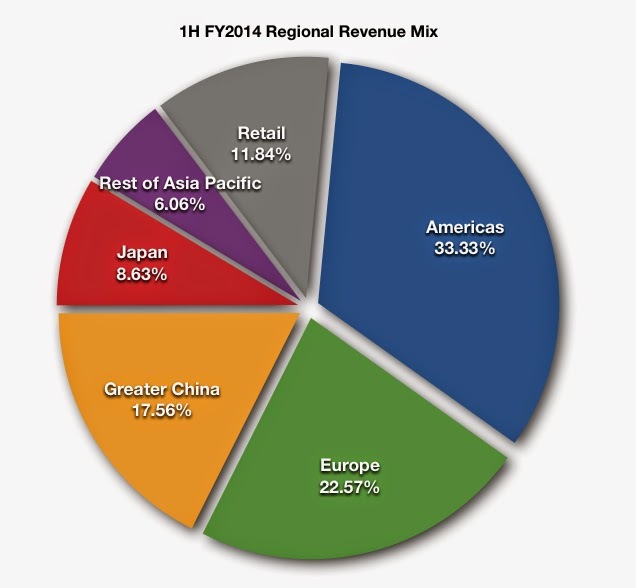 Although in aggregate revenue rose a fairly modest 6.95% in the fiscal year, revenue growth by region varied widely with Greater China and Japan again delivering the fastest rates of growth. 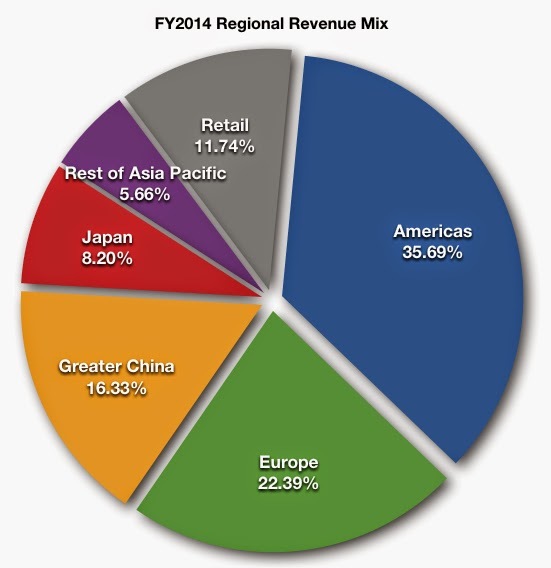 The graph below illustrates Apple’s revenue growth rates by region for the fiscal year. Both Greater China and Japan delivered double-digit revenue growth rates in the period while Europe delivered revenue growth at a rate greater than the aggregate rate of growth for the company as a whole. The Americas region, Apple's largest revenue region, realized revenue growth of 3.95% in the fiscal year with negative growth in the Rest of Asia Pacific region. Concurrent with the start of the December quarter (FQ1 2015), Apple is eliminating Retail as an independent revenue region. Results for the retail stores will be incorporated in the revenue totals for the geographic region in which the stores are located. For the year, Apple reported 437 retail stores of which 40% were located outside the United States. On a national basis with retail store revenue geographically assigned, the United States represented 37.7% of revenue and China represented 16.8% of revenue in FY2014. Japan may become a third national region to contribute 10% or more of Apple’s reported revenue. On Friday, November 28th, Apple’s share price closed the month’s trading at $118.93, up 9.9% from the opening price on November 3rd and up nearly 10.5% from the opening price on September 29th, the first trading day of the fiscal year. Recent analyst revenue upgrades and price target revisions have provided support for the share price. The current Wall Street consensus revenue estimate for the December quarter is $66.23 billion compared to management’s revenue guidance for the quarter of between $63.5 billion and $66.5 billion. However, the current revenue consensus estimate for FY2015 remains a decidedly conservative $210.68 billion and for FY2016 the revenue consensus estimate is a surprisingly low $223.02 billion. In contrast, my revenue models suggest Apple may reach one-quarter trillion dollars in revenue in FY2016 following a revenue performance this fiscal year of $225 billion. On November 19th Morgan Stanley’s Katy Huberty raised her firm’s price target from $115 to $126. She stated investors underestimate demand for the Apple Watch and is forecasting 30 million Apple Watches will be sold in CY2015. She also believes institutions remain underweighted in Apple shares. In my view, increasing institutional demand for shares will buoy the share price during the first six months of the current fiscal year. On November 25th Aaron Rakers at Stifel Nicolaus raised his Apple price target to $130 from $115. On the same day Brian Blair reiterated his firm’s view iPhone unit sales will range between 72 million and 75 million in the December quarter. Although the share price may not go higher in a straight line, I expect a continuing series of analyst estimate revisions over the next several weeks to support the share price into Apple’s December quarter earnings release in late January. Although unit sales expectations for Apple’s iPhone 6 handsets are moving higher with strong evidence of a big market share shift in the high-end smartphone market from competitors to Apple, most analysts remain cautious on their FY2015 revenue and earnings per share estimates. 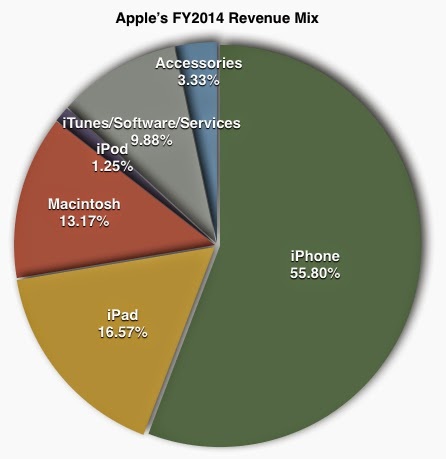 The graph below illustrates Apple’s revenue mix for the fiscal year ended in September. In the 12-month period, the iPhone represented just over 55% of reported revenue. 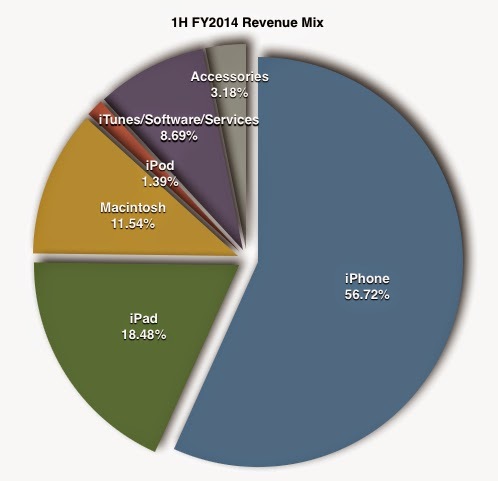 Combined, the iPhone and iPad lines represented over 72% of revenue in the period. On Friday, July 25, 2014, Apple’s share price reached a 52-week closing high of $97.67. This was also the highest split-adjusted closing price since September 24, 2012 and within range of the all-time high closing price of $100.30 set on September 19, 2012. From the closing high of 100.30 on September 19, 2012 to the closing share price nadir of $55.79 on April 19, 2013 to Friday’s closing price of $97.67, it’s been a startling roller coaster ride for Apple’s long-term shareholders. It’s simply a matter of time before Apple’s share price vaults above its previous all-time closing high and begins an ongoing series of new records. Despite the share price volatility of the past two years, Apple’s growth moving forward will be best seen in sublime advances of technologies and less in sharp spikes and slides in revenue and earnings growth rates that have characterized the past four years of the company’s financial performance. Apple is engaged in a game of inches and has entered an era that will again reward long-term shareholders for their conviction, patience and grit. While much attention has been placed on Apple’s recent 7-for-1 stock split, the share price rise from the closing price on the first day of post-split trading on June 9, 2014 of $93.70 to Friday's closing price represents a share price gain of 4.24%. However, the share price rise from the closing price immediately prior to the release of March quarter results on April 23, 2014 has been 30.29%. Apple’s return to organic net growth income growth has delivered extraordinary share price gains in just over three months. Apple has now concluded two consecutive quarters of net income growth following a four-quarter slide in underlying profitability. The graph below illustrates the company’s net income performance over the most recent nineteen fiscal quarters. Rising net income is and will remain the primary catalyst for Apple’s share price appreciation. In the first half of Apple’s current fiscal year, revenue rose 5.22% to $103.24 billion dollars. This is the first time Apple’s revenue surpassed $100 billion in a six-month period and is emblematic of the fact the company’s operations are truly global in scope. According to the company’s SEC filings, Apple manages its business on a geographic basis. 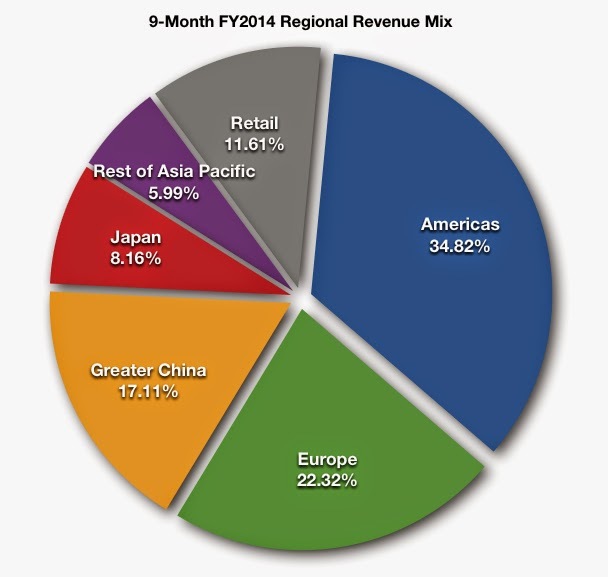 The chart below illustrates the company’s regional revenue mix in the first six months of the fiscal year. For the six-month period ended March 29, 2014, nearly 56% of reported revenue was sourced from the company’s traditional strongholds in North America and Europe. Combined, Greater China and Japan delivered 26.19% of reported revenue versus 22.57% of revenue sourced from Europe alone. Currently, the United States and China are the only two countries that deliver 10% or more of Apple’s revenue. Japan is quickly closing the gap and may soon gain entry to this exclusive group of nations. The graph below illustrates the rates of growth in each of the company’s regional segments in the first half of the current fiscal year. In the six-month period, Greater China delivered revenue growth at a 20.54% rate followed by Japan with a 17.59% growth rate. Europe lagged the aggregate growth rate of 5.22% with a 4.57% revenue growth performance and revenue in the Americas region was virtually static with a 0.04% revenue growth rate. In fact, year-over-year in the Americas region, revenue rose by only $15 million. On Wednesday, April 23rd, Apple triumphantly surprised the market with a return to net income growth in the March quarter following a four-quarter cycle of declining profitability. Although Apple did not set a record for March quarter net income, the company delivered record March quarter revenue and an impressive 22.40% of revenue to the net income line. The graph below illustrates Apple’s net income performance and the percentage of revenue that has flowed to the net income line over the most recent eighteen quarters. On revenue of $45.646 billion, $10.223 billion flowed to the net income line. This was the fifth-highest net income performance in the company’s history and second-highest March quarter net income performance, eclipsed only by the results in the March quarter of FY2012. With the release of March quarter results Apple also announced a 7-for-1 stock split. The likelihood Apple will be added to the Dow Jones Industrial Average (DJIA) after the completion of the stock split in early June added fuel to the immediate post-earnings share price rally. Following the release of the company’s March quarter numbers and accompanying announcements, the share price jumped from a closing price on Wednesday of $524.75 to end the trading week at $571.94. With a current market cap of over one-half trillion dollars, rising revenue, rising quarterly dividends and anticipated fiscal year revenue of over $180 billion, the addition of Apple to the well-known index is viewed as a near certainty after completion of the 7-for-1 stock split. Apple is increasing its share repurchase program from $60 billion to $90 billion with all purchases to be completed by the end of calendar year 2015. As of the close of the March quarter, Apple had utilized $45.9 billion of the previously authorized $60 billion for repurchases. The graph below illustrates the dramatic drop in the company’s reported fully diluted share count over the past several quarters. Management also announced with the March quarter results the company would be returning to the debt table to borrow against the company’s massive overseas holdings of cash and marketable securities. Although Apple reports a US tax expense on all foreign-sourced earnings not permanently dedicated for use outside the US, the payments are not due until the funds are repatriated. As of March 29, 2014, Apple has $19.471 billion in deferred tax liabilities on the balance sheet and $17.0 billion in previously acquired debt for share repurchases. Apple is a global empire with revenue results that place it among the top publicly-traded enterprises on the planet. Apple is also among the largest dividend payers in the world and management is dedicated to returning more than $100 billion in capital to shareholders over a four-year period through a combination of dividend payments and share repurchases. Apple’s brand value is arguably the highest in the world and the company’s balance sheet reflects over $140 billion in cash and equivalents net of debt despite the ongoing capital return program. No matter these superlatives, Apple is challenged to reverse a decline in profitability. The company is in the midst of a multi-quarter decline in net income and a cycle of lower net income per revenue dollar even as revenue rises modestly year-over-year. For Apple’s first quarter of FY2014 ended December 28, 2013, management reported revenue growth of 5.7% to $57.594 billion. In the same 91-day period net income fell year-over-year by $6 million to $13.072 billion and represented 22.70% of reported revenue, below the 23.99% of net income per revenue dollar earned the year before. This FQ1 2014 performance came on the heels of the company’s FY2013 results in which Apple’s reported revenue rose 9.2% to $170.91 billion and net income fell 11.25% to $37.037 billion. Based on Apple’s March quarter revenue guidance, which suggests the possibility of a decline in revenue year-over-year, net income in the current quarter may fall below not only last year’s results, net income is likely to come in well below the results of two years ago. The graph below illustrates Apple’s net income has been in decline on a year-over-year basis since the March quarter (FQ2) of FY2013. Although in FQ1 2013 the company managed a meager rise in net income of $14 million, in the recent December quarter (FQ1 2014), Apple’s net income was $6 million below the results in the prior-year period and only $8 million above the results of two years ago. While Apple’s reported revenue has continued to rise, the company’s net income per revenue dollar has continued to fall. In the December quarter, net income represented 22.70% of revenue versus 23.99% in the prior-year quarter and 28.20% of revenue in the December quarter two years ago.